Preventing violence against women and girls (VAWG) requires more than adopting laws — they need to be effectively implemented. Parliamentarians, NGOs and legal officers met to discuss the issue at a regional conference for Eastern and Central European Parliaments on Making Laws Work to End Violence against Women and Girls. 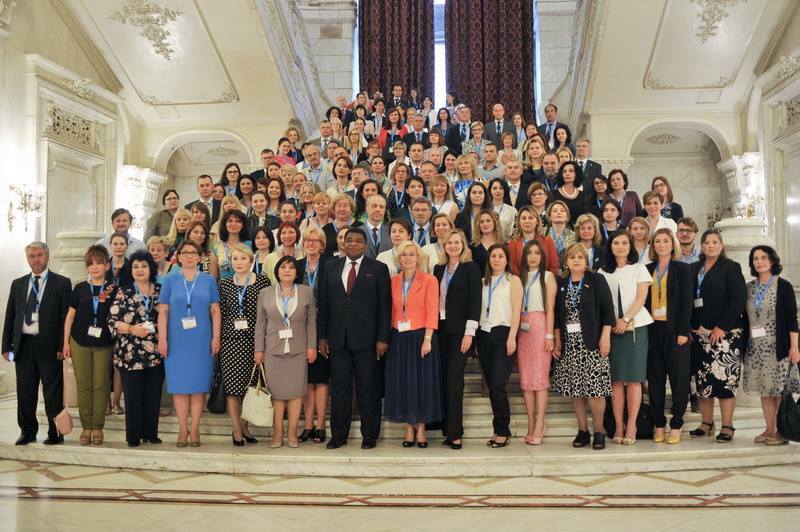 The conference, held from 12 to 14 June, was co-organized by the IPU, Vital Voices, Global Rights for Women and the Romanian Chamber of Deputies, with the support of the Senate of Romania. Between 160 attendees from 17 countries, delegation of Serbia was made up of Dusica Sostaric Blagojevic - SOS Women’s Center Novi Sad, Olivera Simendic - Belgrade City Center for Social Work, Ana Jevtovic - NGO Femina, dr Milorad Mijatovic and Dubravka Filipovski - Members of the National Assembly of Serbia, and Zorana Parezanovic - NGO Atina. At this conference, Atina participated as a leading NGO from Serbia that has been combating human trafficking and all forms of gender-based violence, improving the protection and position of such victims, strengthening gender equality, and contributing to wider social cohesion for 15 years now. The regional conference was a useful opportunity to discuss ways to overcome gaps and challenges in the work, to inspire and empower each other and move forward common policies to improve the systems’ response to violence against women in the countries of the participants. The outcome document of the Conference outlined several strategies for ending VAWG. These include: multisectoral collaboration for a strong community-coordinated response; a focus on the victims in terms of providing them with a safe space to report violence, an array of services to meet their needs, and tools to counter victim intimidation; placing the burden of holding abusers accountable on the criminal justice system; educating children on human rights and gender equality; and engaging men. This final outcome document has been shared with all the relevant stakeholders, and IPU has been asked to bring the consultation and recommendations to the attention of the global parliamentary community and ensure follow up through its programs and assemblies. The regional conference provided an opportunity for country delegations composed of parliamentarians, NGOs and government officials to formulate action plans and apply gained knowledge to their respective countries. On this occasion, the attendees also had an opportunity to visit, and become acquainted with the work of, numerous Romanian institutions, including the Parliament of Romania. The Parliament is seated in the Palace of the Parliament (People’s House), the second largest administrative building in the world, which also represents one of the most significant sightseeing objectives in the capital of Romania, and a meaningful lecture in this country’s history.